I was on an adventure, but not just any adventure. This was an adventure with a purpose. The time was last fall and I was in search of the perfect photograph. Hmmm, that sounds funny; I’m always in search of the perfect photograph! I guess a better way to say it is that I was in search of the perfect photograph for a specific occasion. You may know this already, but I am Vice President of Broken but Priceless Ministries (BPM). We’re an interdenominational, non-profit Christian ministry that seeks to encourage individuals suffering with a chronic illness, as well as the caregivers and family members of the one who is sick. It’s an amazing ministry and I’m so blessed to be part of it! BPM produces an online magazine that is completely free. One of my absolute favorite ministry responsibilities is to make the cover for each issue, and that’s what I was in search of on this particular day. I needed a beautiful fall magazine cover that would showcase the creativity and glory of God. Most of the photographs I take are landscape because they are easier to share on social media. Portrait photographs tend to get the top and/or bottom cut off when you share them on certain sites. However, for a magazine cover, you need those beautiful portrait shots. So I was on a mission! Our first stop was at a little park tucked along the banks of Lake Menomin in Menomonie, Wisconsin. I always forget how pretty this little park is and each trip is a pleasant surprise. I snapped away and got a few good shots to choose from. My method of photography is quantity. I take a LOT of pictures, but I also get a lot of good shots to choose from. As I was getting low and snapping the path and overhanging trees, I looked up. 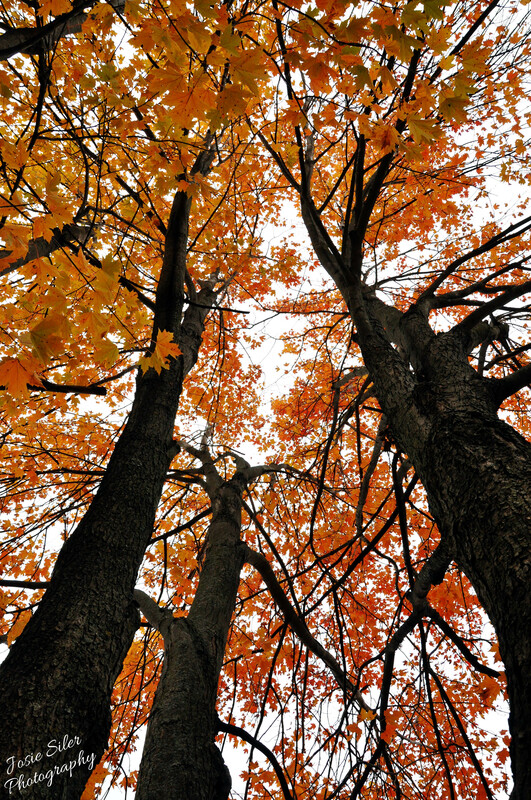 I saw these beautiful trees standing tall and proud, clinging to their beautiful orange leaves, and loosing the battle. I stood up as leaves gently fell around me, pointed my camera to the sky, and captured this shot. It’s still one of my favorites, and even though it didn’t make the cover of the magazine last year (The Dancing Birch won out), it might just make it this year! If you would like to read the latest issue of Broken but Priceless: The Magazine, go to our Facebook page and look for the post that’s pinned to the top of the page. A new issue releases in October! What is your favorite part of fall? I love the boots, crisp air, and all that goes with fall. However, I also love the beauty of the changing leaves. It’s not just the beautiful colors they turn, it’s what they represent. These leaves are dying. They’re falling to the ground to be crunched into the earth by passing feet or shredded up in the blades of lawn mowers. Soon, a thick layer of snow will cover the remnants of leaves and we’ll go into a season of a different kind of hardship and beauty. But soon after that yet another season comes to spring new life into our lungs. The snow will melt, the flowers will bloom, and all will seem right in the world again. We can all take a lesson from the leaves and look for the beauty in the midst of our season of strife. We can look for the joy each day, thank God for His constant presence and comfort, and one day soon we’ll breath in new life and realize that even in this, God is good.